MIAMI — Jean Monestime, the first and only Haitian American to serve on the Miami-Dade County Commission, blazed yet another trail on Monday as he ascended to become the chair of the board of county commissioners. Monestime was unanimously elected by his peers to lead the 13-member board. 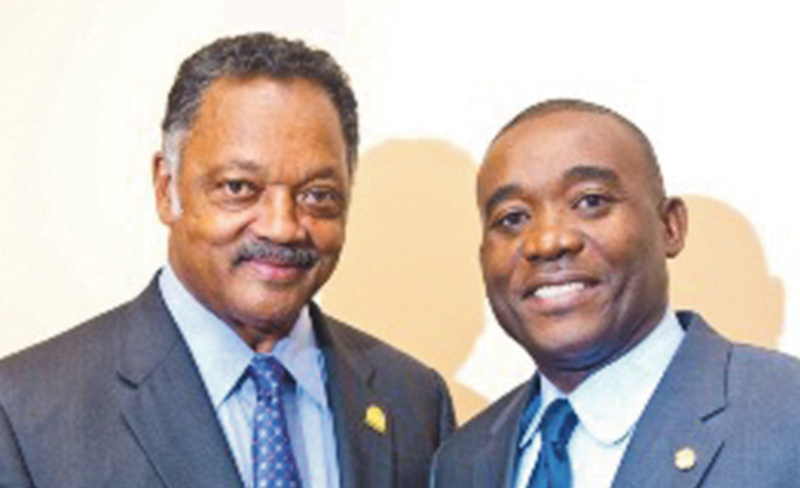 He becomes the first Haitian American commissioner in the position. Esteban “Steve” Bovo, who represents District 13, was selected as Vice-Chairman. They assume their positions Jan. 1. Monestime and Commissioner Audrey Edmonson of District 3 were nominated for the chairmanship. However, before a vote was taken, Edmonson withdrew her name. Monday afternoon, Monestime thanked his colleagues for their gesture, and specifically mentioned Edmonson. Changing the small business set-aside program, increasing available contract funds by 10 times as much. The program has already doubled funds to small businesses participating in set-aside contracts. Sponsored an ordinance that would establish a local hiring goal for all construction contracts over $1 million. That ordinance passed committee just the other day and will be considered by the full Board in a couple weeks. Sponsored changes to the Community Workforce Program so that those job opportunities, which are supposed to go to Miami-Dade residents, actually go to those residents. Monestime was first elected to represent District 2 in 2010, unseating longtime Commissioner Dorrin Rolle. He was re-elected in late August, beating back a challenge from Rolle. In his re-election bid, Monestime had key backing from prominent African-American clergy and attorneys. Prior to his election, he served several years as a city councilman in North Miami. In a statement released Monday afternoon, county Mayor Carlos Gimenez lauded the chair and co-chair. “I congratulate Commissioners Jean Monestime and Esteban Bovo on their elections as Chairman and Vice Chairman of the Board of County Commissioners. I also commend their colleagues on the Board for working together and in a show of unity, unanimously supporting their nominations. “Commissioner Monestime will become the first Haitian-American to lead our 13-member board when he officially assumes the chairmanship on January 1, 2015. His election is further proof that Miami-Dade County is a multicultural, world class community that is committed to inclusion.